The People’s Crusade started before the First Crusade. It was to be a total failure. More than fifteen thousand people joined the army lead by Walter the Penniless. Later Peter the Hermit and most of the crusaders took off to Constantinople, from where they planned to go to Jerusalem. However, Peter the Hermit and his advisors had not paid attention to how they were going to feed this huge army. As a result, wherever the crusaders went, they ate up the land like a mass of hungry locusts. Furthermore, wherever these crusaders went, they plundered the land, burned cities, and slaughtered people. All of the murdered people were Christians. The crusaders then went beyond Constantinople and started their looting of Christian lands again. They were also constantly arguing amongst each other and many people broke off the main group. Now Peter the Hermit went back to Constantinople to request supplies and support. But before he could return the Muslims had gathered an army and attacked the crusaders swiftly, killing most of the invaders. By now, the first of the five armies of the First Crusade were on their way to Constantinople. Godfrey of Bouillon arrived first. Soon after him, Bohemond of Taranto arrived, followed by Count Raymond IV of Toulouse. After that, Count Robert II arrived. Last came Duke Robert of Normandy. Together, they attacked Muslim lands. The city of Nicaea was taken first. Following that, the crusaders attacked and captured Antioch. Nearly all of the Muslims inside were killed by the merciless crusaders. Then the crusaders attacked Marrat an-Nu’man where the crusaders slaughtered a hundred thousand people. (The Templars did the killing even though they were supposed to be kind and sympathetic because they were of a religious order.) A year later, the crusaders attacked Jerusalem. Since the crusaders thought that killing Muslims was very good for the soul, they murdered as many as they could. No one was given mercy. Old or young, sick or healthy, male or female, all were beheaded and killed by the invading crusaders. The city was full of blood that reached up to the knees of the soldiers and up to the horses’ bridles. The Muslims were forced to throw themselves from the tops of towers and buildings, were burnt alive, and the list goes on. The crusaders climbed up to the top of the Temple of Solomon, from where they massacred hundreds and thousands of Muslims. The slaughter was only paused when the crusaders gave thanks to their Lord. Then it was continued with as much ferocity as before. Then, in 1177 CE, a great leader of the Muslims named Salahuddin Ayyubi (also known as Saladin) attacked Palestine and conquered Ghaza and Ascalon. King Baldwin IV, the ruler of Jerusalem, tried to put up a resistance, but could not face the attack and retreated. After his defeat, Baldwin IV, asked the ruler of Karak, Reginald de Chatillon for assistance. Reginald, sent appeals to the crusaders for help. They agreed and started sending their troops to Karak to take revenge of Baldwin’s defeat. This time, however, Salahuddin was defeated. In 1179 CE, Salahuddin went with a large force to fight against the Franks. A fierce battle followed in which Salahuddin was victorious. The next year, Baldwin IV and Salahuddin made a two-year truce. According to the terms of the truce, both parties could not attack each other’s territories. However, Reginald de Chatillon, the ruler of Karak attacked Muslim lands as well as the caravans that were passing by. He also looted many caravans that were going for Hajj. At this, Salahuddin was enraged and attacked Reginald’s fort. A four-year truce was made which was signed by Baldwin IV and Salahuddin. Then Salahuddin and his army went back home. But troubles awaited the Muslims. Soon after the signing of the truce, Baldwin died. Reginald then disregarded the truce and attacked a Muslim caravan and arrested the traders. Despite the many warnings and appeals to stop his cruelties, Reginald went on. He later looted a caravan of Muslim pilgrims and killed most of them. Now Salahuddin could not be stopped. He attacked Karak, occupied it, and appointed an army to guard the Muslim pilgrims. The crusaders were disturbed by Salahuddin’s increasing power and success and united all of their forces to attack the Muslims. Salahuddin camped outside Tiberiade, about fifteen miles away from the armies of the crusaders. After a siege of about six days, he occupied the city. When the news reached the crusaders, they called a meeting. 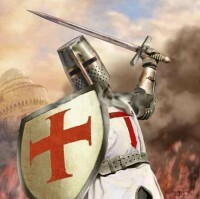 It was decided that the crusaders would go and attack the Muslims instead of just defending themselves. They camped at night in Hittin, sure of an easy victory the next day. However, few knew about the skill of Salahuddin and his bravery and did not know that they were going to be utterly defeated by him. Many crusaders that left to Christian states were treated cruelly by the rulers there. For example, many crusaders left to Antioch, the nearest Christian city from Jerusalem. There the ruler, Prince Bohemond, not only denied them hospitality, but stripped them. They were forced to come back to Muslim lands, where they were treated with great sympathy and kindness. In addition, out of respect for the Christians’ feelings, Salahuddin did not enter the city until all those who wished to leave had left. The fall of Jerusalem sent a wave of fury throughout Europe. Pope Gregory VIII declared a third crusade. The kings of Europe, realizing that Salahuddin could not be dealt by only one or two armies, allied themselves to take revenge. Many European kings took part including Richard the Lion-heart, Frederick Barbarossa, Philip II, and King Guy de Lusignan (who had broken his promise to never interfere in Muslim lands). This crusade, was called by the famous historian, Gibbon, as “the most stupid and savage refuse of people”. All the crusaders achieved was the city of Acre which was only conquered after a siege of two years and the death of about one million and twenty thousand crusaders. When the city was finally acquired, a treaty was signed in which the Muslims had to pay 200,000 gold coins within one month and the Holy Cross was to be returned to the crusaders. Otherwise, the 2,700 captives inside the city (who were to be released if the payment was fulfilled) would become slaves. However, since Salahuddin could not pay the price because the distances were far between Muslim lands and he did not have enough resources to pay it, the Muslims were all massacred. Other crusades include the Children’s Crusade that took place in 1212 CE. A French boy, speaking in the manner of Peter the Hermit, lead several thousands of his young followers. The young crusaders arrived at Marseilles, expecting the water for them to open so that they could walk to the Holy Land. However, most of the crusaders were sold to slave dealers by merchants. This crusade was a great embarrassment to the Church.